D-6351, Green Color, Shimmery Finish Paper, Ribbon Layered Cards, Designer Multifaith Invitations, Exclusive Invitations. Broach Card. 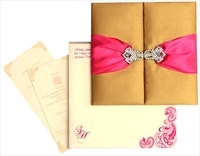 Satin band and Card fabric can be customized in any color of your choice on extra cost. 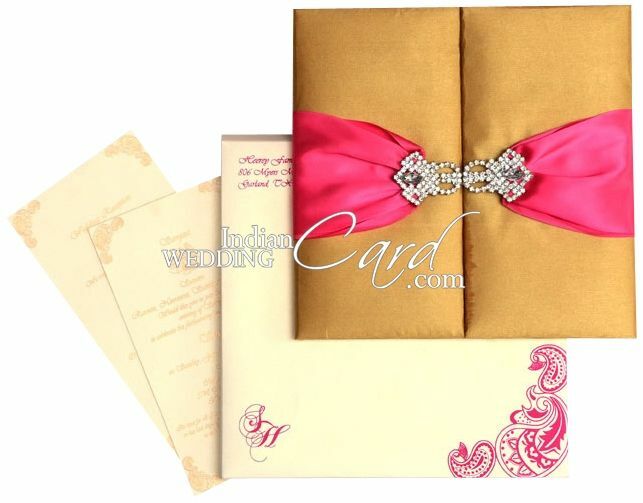 Gold color silk satin cloth for the door open style main card, inside left n right and pocket. 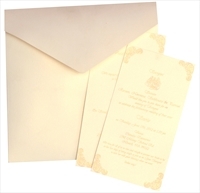 Central insert and mailing box envelope in cream shimmer paper (250gsm). Front has satin ribbon with interlocking broaches.